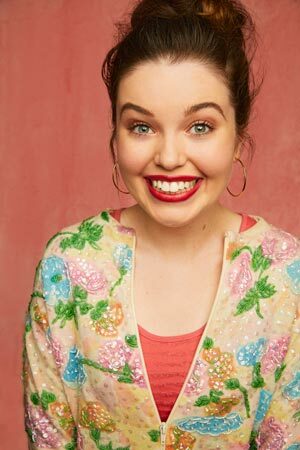 Following an exhaustive search, Sydney Theatre Company and Global Creatures have announced that newcomer Maggie McKenna has won the lead role in one of the most anticipated shows of 2017 – Muriel’s Wedding The Musical! The 20-year-old Melbourne born and raised actress has recently returned to Australia from Los Angeles where she trained at the prestigious American Musical and Dramatic Academy (AMDA). This marks her professional stage debut in what will be the world premiere of the musical. This stage version of PJ Hogan’s iconic hit 90s Australian film has been updated by the writer himself, with original music by Kate Miller-Heidke and Keir Nuttall alongside those beloved ABBA numbers. Muriel Heslop is back! And this time she’s singing. Stuck in a dead-end life in Porpoise Spit, Muriel is obsessed with the music of ABBA and dreaming of a fairytale wedding – the white dress, the church, the attention. Unfortunately, there’s one thing missing. A groom. Leaving small-town life, her long suffering mother and bullying father behind, she follows her dreams to Sydney with new best friend Rhonda. There she ends up with everything she ever wanted – a man, a fortune and a gazillion Twitter followers. That’s when things start to go really wrong. Joining the Maggie is Justine Clarke as the long suffering Betty, with other members of the Heslop clan played by Briallen Clarke (Joanie), Michael Whalley (Perry) and Connor Sweeney (Malcolm), while Helen Dallimore plays the strangely ever-present beauty consultant, Deidre Chambers. Celebrating her marriage to Chook (Aaron Tsindos), Tania Degano is brought to life by Christie Whelan Browne, accompanied by a posse of bridesmaids, two of whom are played by Manon Gunderson Briggs and Laura Murphy. Brice Nobes, the first guy to ever ask Muriel on a date, is played by Ben Bennett and Stephen Madsen is Olympic swimming hopeful Alexander Shkuratov, coached by Josh Quong Tart’s ruthless Ken. The 28-strong cast also includes Sheridan Harbridge, Mark Hill, Annie Aitken, Kaeng Chan, Tony Cogin, Adrian Li Donni and Kenneth Moraleda. The dream theatre director/designer team of Simon Phillips and Gabriela Tylesova lead a stellar creative team which also includes choreographer Andrew Hallsworth, musical supervisor Guy Simpson and musical director Isaac Hayward.